This is something that I have, only recently, begun to get serious about. Spending time in my bible. You see, I have found that spending time reading my bible is simply the best way to spend my time. I have found that when I read my bible, especially for long periods of time, I feel refreshed, calmer and more sensitive to what God wants me to do for the day. Seriously. I have found that reading my word has brought me closer in a walk with Christ. And not just reading it…but thinking on it and wrestling with it. Being a part of Ryan Dalgliesh’s SevenTen Discipleship program has really changed some behaviors of mine. But…I wouldn’t say it is the class…Though, I do think some of the habits that the class is giving me are helping out. We are forced to abide in, study and learn [TRULY LEARN] the text. Dig deeper, see what is going on…and absorb it. We aren’t supposed to take a 5 minute quick devotional in the morning, and call it good. God commands us to LIVE in his word…to ABIDE in it. Not to just pull it out when we have time, but to make time for it. Jesus takes our time in the word very seriously. I mean take a look at John 8:31! Want to know if you are a true, God-seeking, disciple of Christ? 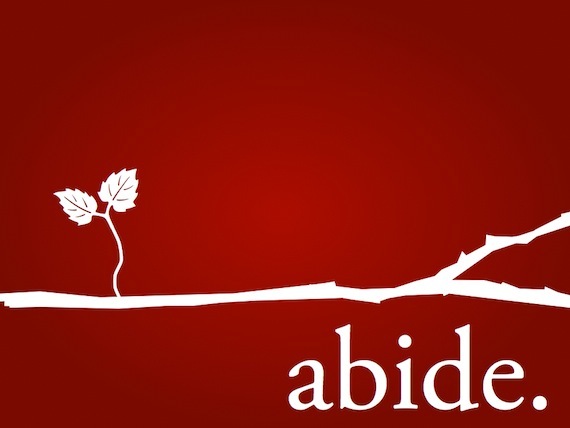 When was the last time you honestly ‘abided’ in His word? Don’t answer me…check your heart. Repent. Abide. Next Post Next post: Gut Check. In that, you will find change. What do you do during that time? Read? Journal? Just depends on the day. Usually just read. Great post John. I say 5 minutes a day is not enough… 15min at least plus time to pray. We must learn it and live it! There are some days when I struggle to read a chapter…others when I cannot get enough. oh snap… way to call me out dude! But I appreciate it. And I have lately been trying to dig deeper into the word because that is one area I have been lacking. Thanks for your encouragement. I agree and yet, I have an incredibly difficult time focusing in the morning. It doesn’t matter how early I get up, I just can’t focus. What I do to combat this is I listen to my Youversion app on the way to work. Listening to the ESV version and that dudes smooth voice actually helps me ‘get it’ in a whole new way. There is something to reading it though. I usually read and study in the evening. Thanks for the challenge! Good words.